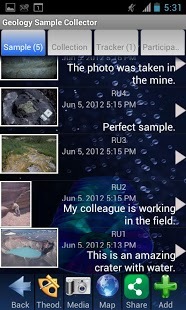 The Geology Sample Collector allows you to track and document your field work incorporating images, video, audio recordings, and/or text. 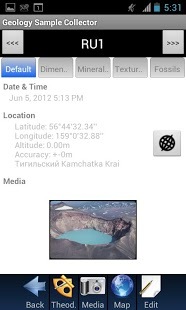 It also allows you to track (with GPS) your path and enables the data to be synchronized to our website, edit, and/or share your work with others.You can also allow colleagues to view your work during or after your field trip by sharing it through your website, social networks, e-mail, etc. Once the collecting is uploaded to your website, you can edit the data, create reports and/or maps, and download the data or reports to spreadsheets or other documents. (You do not need to have access to the internet to run the application). Give it a try, it is free. Once your collecting is completed, you can automatically create a powerpoint or video of the sampling. 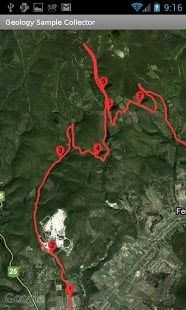 Track unlimited GPS paths within each sampling program and have each track/path displayed on a map in different colors. Create events during your field work documenting sample sites, outcrops, structures, fossils or minerals, formations, etc. or even the hotel or camp area where you stayed. Each event is marked along your GPS track(s) with a numbered pin on Google maps allowing instant access to the media you captured at each site. 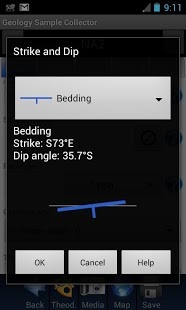 When an event is created it automatically documents the longitude, latitude, altitude, time, and date with instant access to the smartphone camera, audio recorder, notes, and a theodolite tool (for calculating distances to or elevation of objects) to further document the event. The application has a strike and dip tool built into it to allow you to measure planar and linear features. 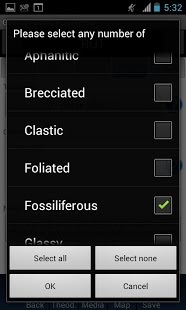 Each event comes with formatted fields to record a description of the event, detailed notes, rock type, rock age if known, (or choose the age of the formation from a drop down list of the geologic time scale), sample weight, temperature, and pressure. Specific fields can be hidden and an unlimited number of additional fields can be added. Separate folders allow you to document sample size, minerals. textures, and/or fossils in the sample. 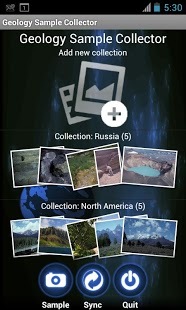 Share your collecting while you are in field instantaneously with colleagues or other samplers with the ability to post all your GPS tracks and media on any of an almost unlimited number of social websites or communicate information via e-mail, Skype, and other IM systems. Create your own free website to share your sampling with others in real time. The website includes a gallery of your videos and images along with standard Google maps with tracks and pins representing events. Don't worry about the loss of any media, data, or notes. The geology sample collector application automatically synchronizes your data in the background in our database and, if desired, your website, effectively backing up your data for later use. Once you return from your collecting, the data can be downloaded to a spreadsheet, powerpoint, or other documents. You can also extensively filter the information to hone in on certain aspects of your field work. Our reports section of the website allows you to create specialized documents and graphs from the filtered data. 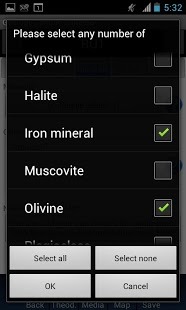 You can also upload data once you return such as geochemical data if the samples are analyzed. If others are sampling with you, they can add their own events, media and data, through their smartphones, to each event if you choose to share your username with them. All smartphones will be instantaneously updated with the shared information through the application and include all the collected information on your website. Or each individual on the field trip can create their own account and website on MajorForms to document the work themselves. Make your own sampling video or powerpoint presentation automatically once you return to share with colleagues or for presentations. With one click, the videos, maps, and images are integrated into a video timeline or a powerpoint presentation.